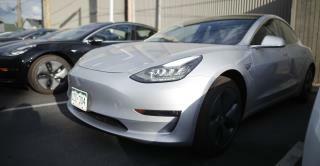 (Newser) – A wireless update of antilock braking software improved the stopping distance of Tesla's electric Model 3, prompting Consumer Reports to reverse course and give the car its "Recommended Buy" rating, the AP reports. The magazine said Wednesday that the update cut 19 feet off the car's stopping distance from 60 miles per hour. A previous test—the results of which were released a little more than a week ago—found that it took 152 feet for the Model S compact car to stop from 60, the longest braking distance of any modern car the magazine has tested. The improved braking raised the car's score high enough for it to receive the coveted recommendation. But Consumer Reports still has concerns over wind noise, a stiff ride, and the touch-screen controls that could distract a driver. "A wireless update of antilock braking software improved the stopping distance of Tesla's electric Model 3, prompting Consumer Reports to reverse course and give the car its "Recommended Buy" rating, the AP reports." Yeah, and update and a "contribution" to CR. If your braking system can be updated wirelessly, it can be hacked. We need to stop giving Internet access to critical systems.